Mac and Barney discuss with some degree of trepidation the alarmingly increasing rate at which new electronics technology is being developed and marketed. As service shop owner and technician, respectively, they needed to constantly educate themselves on new components and circuits in order to stay current and be efficient enough to turn a profit. Mac recounts his lengthy background beginning with the days of mainly battery-powered AM radios, and progressing through AC-DC, FM and all-band (shortwave) radio, B&W television and the color TV, CB radios, and a new breed of appliances with electronic controls. As with most technical fields, be it electronics, medicine, mechanics, chemistry, finance, etc., rare is the person who can keep abreast of and master the entire field. Branching off into areas of specialties is necessary to be an effective implementer and problem solver. Today's technician must learn to cope with the flood of information coming from R&D labs or be swamped. It was only April, but the coming summer had issued an unexpected sample. The sun blazed down on the greening lawns; fallen red buds carpeted the sidewalks beneath the maples; the thermometer stood at an astonishing eighty degrees; and an ever-so-gentle breeze, redolent with the exciting smell of warmed and awakening earth, wafted through the open rear door of the shop where Barney stood watching a spirited tug of war between a determined robin and a huge and rubbery night crawler. "Hey, Mac," the youth called over his shoulder to his employer working at the service bench, "do you ever feel you're running on a treadmill that's being continually speeded up? I mean doesn't it sometimes seem humanly impossible to keep up with all the new things in electronics that are continuously popping up like spring mushrooms? Sometimes I feel just like that robin. While he's working hard to get that one worm out of the ground, a half-dozen others are getting away." "I know the feeling well," Mac confessed, smiling sympathetically. "I almost hate to see new models of TV sets come out because I know they will include new circuitry I must study - even before I've completely caught up with last year's new circuits. And if you think it's bad for you, just remember I started in this game when all I had to understand was how a battery-operated radio receiver worked. "Since then I've had to try to master a.c. radios, a.c.-d.c. sets, all-wave receivers, FM receivers, hi-fi receivers, stereo receivers, auto radios, and CB transceivers. Next it was black-and-white TV, u.h.f. TV, and color-TV. Then I had to learn the cotton-picking circuits all over again in terms of solid-state diodes and transistors instead of tubes. At the same time I had to be boning up on scopes, sweep generators, marker generators, square-wave generators, dot generators, color-bar generators, and-"
"Stop!" Barney interrupted. "You've made your point. Don't beat it to death. But I think you'll agree new things in electronics are coming faster and faster with each passing year. I remember you told me just a few days ago that man's store of technical knowledge was doubling every ten to fifteen years." "That's true," Mac said with a nod. "Several factors contribute to this tremendous acceleration in technical learning. Improved communications is probably one of the most important. A new scientific discovery in any part of the world spreads rapidly over the entire globe so that other scientists can start experimenting with it and putting it to work almost immediately. The many uses quickly found for the laser are a good example of this. "Another factor is the steadily shrinking time between the birth of a new device in the laboratory and its practical application. For example, only three years elapsed between the discovery of the transistor and the mass production of these units. Also, our widespread and diversified technology provides many areas into which almost any new discovery can be plugged to produce whole families of new products. A good example is the silicon controlled rectifier. You find it used in photography, in the chemistry laboratory, in medical equipment, in electric power tools, in household appliances, in smoke detectors and burglar alarms, in lamp dimmers, and in all sorts of industrial equipment. "Finally, knowledge begets knowledge. Modern astronomy couldn't get going until Galileo figured out how to build a telescope. Da Vinci understood the theory of flight, but it was not until we knew how to make a gasoline engine that the airplane became possible. The village blacksmith, no matter how well he understood the theory of 'current carriers,' could never have built a delicate junction transistor. That had to wait until men knew how to grow and to precisely dope crystals of germanium and silicon. The more we know and the more techniques we have at hand, the easier it is for us to make new discoveries and to come up with new answers to old problems." "Well," Barney said, "you've done a pretty good job of explaining why we are beset by this worsening blizzard of new discoveries, but you haven't told me how to cope with it. Do you have the answer to that one?" "Only a partial answer based on my own efforts," Mac admitted, "but you're welcome to that. First, I try to mark off a major field of intense interest - electronic servicing, in my case, because that's my bread and butter - and to keep it separated from what I consider peripheral fields, such as electronic applications to medicine, computers, CATV, industrial design and fabrication, communications, oceanography, air and water pollution, and space. And I may as well confess I'm always interested in electronic gadgets. "Then I try to put first things first by concentrating most of my reading and study on servicing. I feel I should, as nearly as possible, know all about this field. At the same time I want to have a general knowledge of the whole spectrum of electronics. Primarily this is because I simply want to know about it, but at the same time I'm never sure but that a discovery which seems to be away out in left field is going to move into my area of intense interest. I saw it happen with transistors." "That sounds like a reasonable beginning," Barney said, "but how do you actually go about keeping up - even with just servicing? Do you concentrate on books, magazines, service data, or what?" "I use all of them. I rely on books mostly for basic knowledge because the field of electronics is moving too fast for book publishers to keep up with the leading edge of it. By the time a book is written and in print, it is already obsolescent as far as current practice is concerned. Happily, though, basic theory does not change. A resistor still limits the flow of electric current and a capacitor still passes a.c. and blocks d.c., no matter in what circuit they are found." "You have quite a library of electronics books, both here and at home. Do you need all those? Can't you use just one good book on theory?" "No, because even basic electronic theory - embracing as it does the theory of electricity - is so vast and varied. D.c. circuits, a.c. circuits, vacuum-tube theory, solid-state theory, high-frequency propagation, radio circuitry, black-and-white TV circuits, color-TV theory and practice, servicing tools and techniques - each of these is a tremendous field in itself. At the same time, I like to have theory books written on two different levels: one at a popular, easily grasped level, and the other at a more precise mathematically correct level." "Is this because you find it easier to grasp difficult theory by taking it in two steps?" "Partially. It is sort of like using a microscope. If you start with a lower-power objective and examine a subject and its background to locate the important features and then switch to a higher-power objective to see the fine detail in areas of particular interest, you have a much better understanding of what you're seeing. The same thing applies in trying to absorb hairy electronic theory." "Okay, now how about that 'leading edge' you were mentioning? How do you keep informed on the flood of new developments in electronics pouring out of the research and development laboratories every day?" 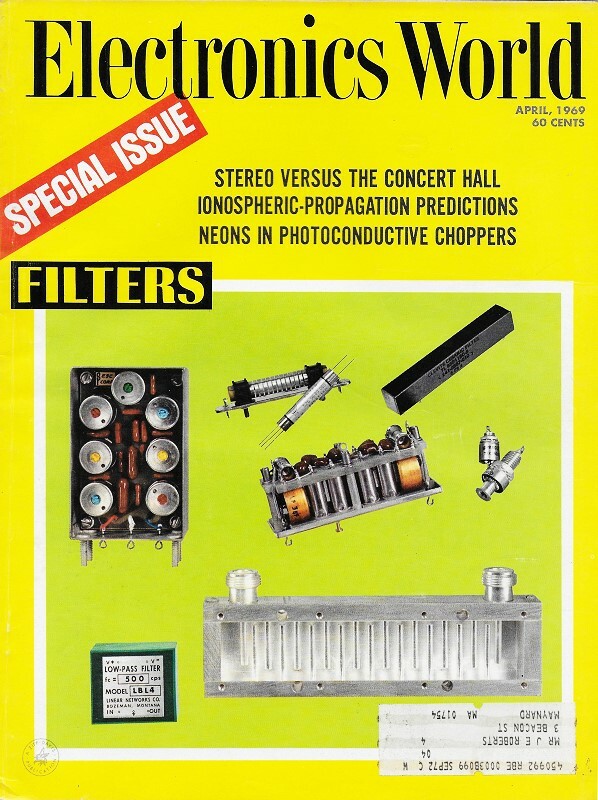 "I rely on my technical magazines, on the house organs of electronic concerns, and on the technical sections of popular magazines and newspapers for that. The information I get from these sources is, above all, timely; but it also provides me, again, with information presented at different levels of complexity." "You surely don't try to remember everything you read. How do you find a particular bit of information later when you need it?" "You're so right! I can't begin to remember everything I read, nor would I want to. All I try to remember is that I've read something somewhere on the subject, but I do try to make locating as easy and painless as possible. "One way I do that is to cut the annual indexes from each of the many technical magazines we take and file them. Since these are usually pretty well cross-indexed, they ordinarily enable me to find an article vaguely remembered even though I don't recall the title of the article, how long ago I read it, or even in which magazine I read it. Experience has taught me I need keep magazines on file here in the shop for only five years. In that span of time, almost everyone of the magazines will cover every major facet of servicing at least once; and any servicing article over five years old is likely to be pretty much out of date and it becomes expendable." "How about the articles you read in newspapers and in other magazines that pertain to electronics?" "I clip them out and file them according to subject matter. I place them in large manila envelopes and write the titles of the articles on the outside of the envelope. One envelope, for example, will be labeled Medical Electronics; another, Pollution; another, Space; still another, Computers, etc. You'd be surprised at how rapidly those envelopes fatten up and how often I find occasion to dip into them. Time and again I find I want to supplement something I'm reading today with something I've read previously so I treat myself to a 'lucky dip'." "Every now and then I see a program on TV about some phase of electronics - say computers or space travel - that contains facts and information I'd like to keep. Do you do anything about these?" "On occasion I've taped one of these programs, but I don't try to preserve the whole tape. Locating what you want on such a recording is too time-consuming. I play the tape back while the program is still fresh in my mind and take notes on the parts that interest me and file these" notes in the proper manila envelope. "With all this, do you honestly feel you're staying on top of the subject of electronics? And do you think all these little memory joggers are really worth the time and effort you expend on them?" "Only to a degree. But I most certainly feel I'm more nearly abreast of what is going on in my own and neighboring fields than I would be if I made no organized effort to keep up and depended solely on my own experience and my memory. Even a young man's memory, as Mark Twain knew, can play him a dirty trick. Remember he said that when he was a young man he could remember anything - whether it happened or not! But don't you really think you've suckered me into letting you and your spring fever off work about long enough? That robin you were watching has finished his job and flown away a long time ago. Let's see you fly over here to the bench and start slinging some solder!"